Being in the entertainment business since 1997, Ram Mohan is probably one of the few management professionals who found his niche in the film industry. Emulating the likes of other MBA graduates like Mani Rathnam, Bobby Bedi and Nittin Keni (producer of “Gadar”), Ram Mohan worked with Suresh Productions, UTV and Just Yellow Media before venturing on his own with Art Beat Capital Pvt Limited. 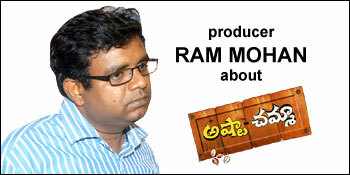 His first production “Ashta Chamma” will hit the screens in the first week of September 2008. What made you come into the industry? There is an old joke in the industry “There are only two kinds of people who come into the movie business. One who lost everything and the other who made billions!” Well, I belong the former category. When my business failed in 1996, Suresh Babu asked me to work with him as a consultant. And that’s how it all started. How does an MBA from IIM help you in this line of business? First of all, I am not an MBA, I am a PG Diploma in Management. That’s what you get in IIMs !! In fact, one of my ex-employers got worried when I wrote PGDM in my resume. He thought I did some 3 month course and was parading myself as a IIMA product! The best thing it does to you is, it opens doors. People look up to you and say “Wow!! You are from IIM A”. Thankfully, they don’t ask what were your grades there! So for a low grader like me, I have to sound very intelligent and make “motherhood” statements on where oil prices are headed, how the industry will tackle piracy! On a serious note, IIM A follows the case study method of teaching. Every class (To bunk, you need a medical certificate! ), a case study is discussed. So it kind of broadens your horizon and enables you to identify problems and come up with multiple solutions, and zero into what could be the best solution. It disciplines your thought processes, organizes a professional life, teaches you how to file in order, generate more and more reports!!! I am waiting for Chetan Bhagat, the famous writer who is also from IIM A, to write one book on this!! I am curious how it helped him write books!! Do you think more management professionals will help this industry get more organized and professional? Who says the film industry is less organized or unprofessional? I worked in varied sectors before joining the entertainment business. This business is highly organized, more efficient than most sectors. Where else can you hire an air-conditioned car for 24 hours for less than thousand bucks??!!! That’s the detail of costing efficiency this business runs with. The movie business has a low success rate. A good professional is one who can “up” that rate for his company. Just like a Rama Naidu garu did over 35 years, or a Suresh Babu did in his last 15-20 movies or a Ronnie Screwvala did in the past decade. They are not management graduates, they are professionals in the business. This is what a management guy should aspire to be. I know a lot more MBAs are coming into the business, but let me caution them. This is not some glamorous business where you get to party with stars, nor is it an unorganized business, which you think you, can revolutionize. This is a job where you need to show value, not just carry a chip on the shoulder. Love the Industry, and it will love you back! How different will an Art Beat Capital be? It doesn’t sound like a Production house. I spent a couple of years working as an Investment Director with a Private Equity Fund. The business is somewhat similar to movies. You put your money there behind a promoter, work with him to generate greater value, and the final result is to get a return on your investment. We do the same here. Put your money behind a director; work with him to get a good return on the investment. In both the cases, you run the risk of not getting even your investment back! So I found the name apt..
Art Beat Capital is like a venture investment company. We have a few small investments in varied sectors. I hope to spin off Art Beat Capital’s movie business into a separate company, post “Ashta Chamma” release. How different will Art Beat Capital be as a production house? Our job here is to entertain. Nothing else. I will always remember Rama Naidu garu’s words when I joined his company. “People come to the theatre and pay you money to watch a film. They should not curse you when they leave the theatre”. We promise to entertain. And entertain you fully!!! “Ashta Chamma” is one of the funniest and whackiest films ever made in recent times. That’s my guarantee to the audiences. What made you go with “Ashta Chamma” as your first film ? Primarily, Mohana Krishna Indraganti. He is an amazing writer and a director. Movies are essentially a directors’ medium. I wanted a good friend like him, to helm the affairs with my first film. The second factor was the story idea and the script. It is pure, unadulterated Fun!!! I love humor. There is too much cynicism in our lives today. This movie will make you forget all of that. You will come out refreshed Rest of it, all fell into place!!! How did your experience with Suresh Productions, UTV and Just Yellow help you? UTV in Mumbai was an amazing experience. It gave me the confidence to “scale up” and “think big”. Finally, Just Yellow, thought me how to survive in the most trying circumstances, with sheer will and power of scripting. Hats off to Gunnam Ganga Raju. So what can audiences expect of “Ashta Chamma”? “Ashta Chamma” is an laughter riot from the first minute. Full Time Pass!! Two hours of pure unadulterated humor. Just come to the theatre, laugh and enjoy. And while you are going home, Bless our team!! And recommend the film to all your friends!! There is so much of fresh talent in the film. Both our male leads, Nani and Srini, are making their debut with this film. Two Telugu girls, Swathi and Bhargavi are the female leads. It is a sincere attempt at injecting freshness into story telling. It seems like “Ashta Chamma” is doing good business pre-release. How did you manage to excite a film maker like Sekhar Kammula to buy the overseas rights? I never knew Sekhar Kammula personally. Over the years since his “Dollar Dreams”, I always appreciated his work as a film maker and more appreciative of the struggles he went through, as a producer, when he made “Anand” and “Happy days”. I went to him through a common friend to seek his advice on how to go about the overseas business. We shared a good vibe and I invited him for a screening of the film. The moment the film ended, Sekhars’ first words were “Ram, don’t sell the film. You are in the right hands of Suresh Babu garu. Just release the film”. That made my day. Half an hour later, when Sekhar called and said “Ram, I will buy your overseas rights”, I didn’t know how to react. It is the greatest tribute a fellow film maker can give. Saying good things is one part, but to actually buy the overseas rights, is huge. Words cannot express the excitement me and Mohana Krishna shared that night. Coming to good business pre-release, the true test for us lies in the box office response. I would like to thank a lot of people for the blind faith they had in our team. Suresh Babu, ‘Victory’ Venkatesh, my friends and family, our technicians and colleagues who worked with me at Suresh Productions, Ronnie Screwvala and Zarina Mehta-Screwvala, Gunnam Ganga Raju, ‘Gemini’ Kiran, GK Mohan, Sanjay Reddy of Zee TV, Ashwin of BIG, ‘Priyadarshini’ Ram Reddy, Sunita Tati of ‘Radio Mirchi', Ravi Prakash of TV 9, and of course, Jeevi of idlebrain. The list is endless. So much of blind faith is overwhelming, truly.